The EF lens mount was introduced in the same year that the EOS was announced – 1987. EF lenses, like the FD lens system that went before, gave full coverage to 35mm EOS film cameras, then subsequently full-frame – 36 x 24mm sensor – digital cameras. Then, in 2000, along came a camera with an APS-C 'crop' sensor – the EOS D30. The main reason for the introduction of the smaller sensor was cost – full frame sensors are expensive. Crop refers to the fact that the image you get with the smaller sensor is a cropped part of the image obtained with the full frame sensor. So what does this mean for your photography? There is a lot of confusion about crop factors, extended reach and telephoto effects when using lenses on APS-C cameras. First, let’s dispel the myth that the focal length of a lens changes when switched between a full-frame camera and an APS-C camera. It doesn’t. Focal length is a characteristic of the lens and is not affected by the camera. What does change is the field-of-view. Take a look at the image above left, shot with an EF 400mm lens. A full-frame camera captures the full image. An APS-C camera only records a part of the full image (as shown by the white box on the central image). When you come to display an image to fill a computer screen or a print, the result from the full-frame sensor is shown above left. The result from the APS-C sensor is shown above right and appears to show an increased telephoto effect. In fact, the APS-C image has been enlarged more than the full-frame image to match the display size. It is a magnification effect, not a change of focal length. You could get an identical result by enlarging and cropping the full-frame image. There is no change to the image created by the lens – it’s simply that the smaller sensor only captures the central area of the image. The rest of the image falls outside the area of the APS-C sensor. All lenses produce circular images, but the sensor only collects the data that falls onto its rectangular surface area. 1) All lenses produce circular images. We never see this because digital sensors are rectangular. 2) The lens circle produced by EF lenses is large enough to cover a full-frame sensor. 3) When an EF lens is used with an APS-C sensor, there is a lot of cropping of the image. 4) EF-S lenses give a much smaller image circle than EF lenses, but the cropped image size remains the same. So essentially this means that if you have a full-frame and an APS-C camera side by side, you need a longer focal length lens on the full-frame camera to see the same view as the APS-C camera. But that is not a common situation for most of us, so it is best just to get used to the view given by a lens on your camera. Our advice? Forget about crop factors! A standard focal length for a camera is usually taken as the diagonal of the image frame. On a full-frame camera this is 43mm – and so typically a 50mm is regarded as a standard lens for full-frame purposes. On an APS-C camera it is around 27mm (43mm divided by 1.6). These are the benchmarks for identifying lens types. A focal length greater than the standard is telephoto and a focal length less than the standard is wide-angle. This is much more useful than knowing the crop factor. When Canon introduced the EOS camera system back in 1987 it featured a new lens mount – the EF mount (short for ‘electro-focus’). A range of EF lenses was introduced at the same time and the number has increased over the years. EF lenses have an image circle large enough to cover the full- frame format of film and some digital models. In 2003 Canon introduced the first EF-S lens, alongside the EOS 300D. EF-S lenses create a smaller image circle to suit the APS-C format. So an EF-S lens mount was introduced. EF and EF-S lenses fit the EF-S mount, but only EF lenses fit the EF mount. What does the ‘S’ stand for in ‘EF-S’? It is either ‘Short’, as in short back focus or ‘Small’, as in small image circle. ‘Small’ is the more accurate term. 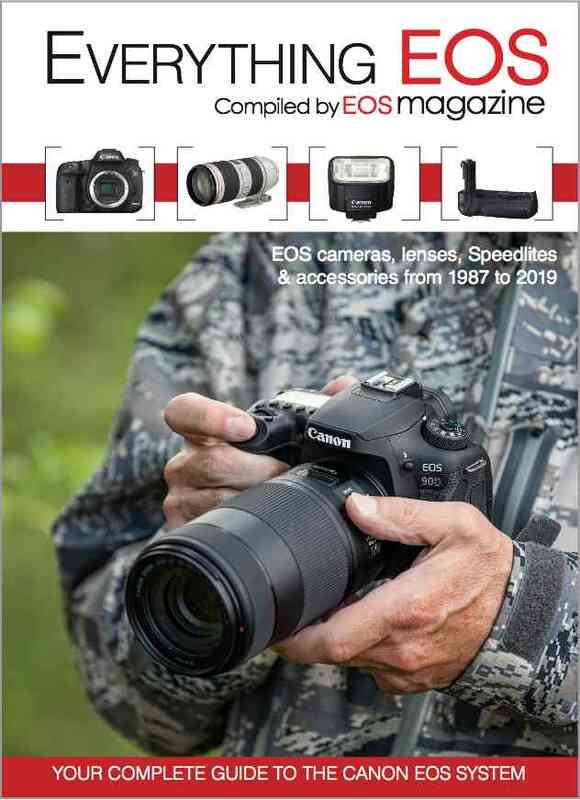 The press release for the EOS 300D talked about the ‘short back focus’ of EF-S lenses. Back focus is simply the distance between the rear of the lens and the digital sensor. This distance is shorter for some EF-S lenses than for EF lenses. However, it soon became apparent that not all EF-S lenses needed the shorter back focus. In 2004 a Canon technical report refers to EF-S as meaning ‘small image circle’. The first two EF-M lenses – the EF-M 18-55mm f3/5-5.6 IS STM and EF-M 22mm f2 STM – were introduced in October 2012 alongside the original EOS M model. EF-M lenses only fit the EOS M-series cameras and have been optimised for the APS-C sensor and to complement the smaller and more compact form factor of the EOS M-series. A new camera system – the EOS R – brought with it a new lens mount in August 2018, the RF lens. Canon is excited about the new mount, because of its design potential, and in fact the new full frame mirrorless system was built around the lens mount.